The R225 bio-shredder is a very compact, professional machine with a new mixed cutting system formed by a rotor with 8 mobile hardened steel hammers, 2 fix hardened steel blades placed on the edge of the rotor and some ejection blades placed inside the rotor for throwing out the minced material. This new system allows you to introduce into one single hopper material of both large and small dimensions, with no need to tear apart small branches from the main branch, assuring a very high output per hour. The direct ejection of the shredded material through the rotor, without the use of any additional fan and related transmission system, reduces both noise level and maintenance operations. The hydraulic feeding roller with adjustable speed and rotation direction that is placed inside the hopper automatically carries every kind of vegetable waste, even damp and fibrous wood, such as palms and lindens, towards the cutting group (maximum diameter 90 mm). The material is discharged through a 270° rotary, 1550/1690 mm high ejection pipe with adjustable throw depth. 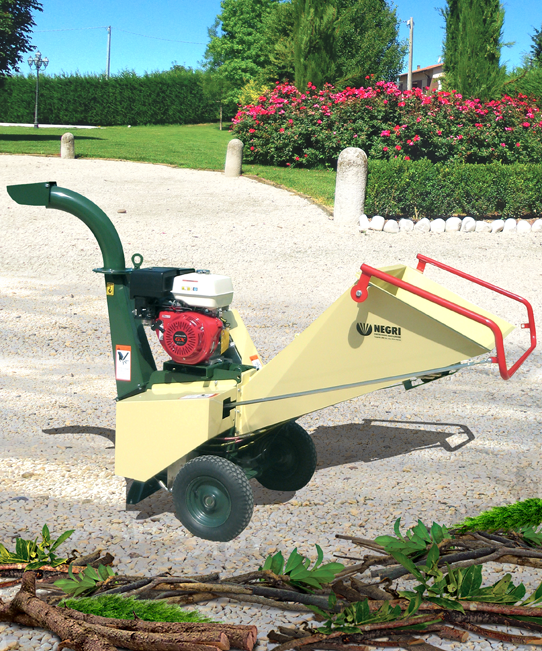 The belt transmission for the electric version, the belt transmission with hydrodynamic joint for petrol engine versions and the transmission with gearbox and elastic joint for the tractor version make this bio-shredder a safe machine even in case of accidental introduction of inadequate material. The R225 is proposed with petrol engine Honda or Subaru, with electric engine 380V or in tractor version with three-point linkage. Built in an easy and sturdy way, the R225 is easy to use and to move thanks to its perfect balance and its large-size pneumatic wheels. The models with petrol engine are available in EVO version too; this version differs from the standard one because of the bigger hopper and the higher discharge height (1690 mm). The EVO versions are proposed with non-homologated agricultural carriage, with homologated street carriage or with tracks. The tracked version is equipped with hydraulic-controlled rubber tracks and it can work on every kind of ground (27% max. slope). The operator controls the machine movement by means of a two-lever console, placed on the machine in a comfortable position, which allows you to see the whole working area. Thanks to the compact dimensions, the lifting hooks and the great handling, it is even easy to load the machine on little trucks or vans using ramps. All versions are manufactured according to the safety systems in compliance with the current European standards. Copyright © 2019 P.J. Callan Ltd.